An intranet or digital workplace is more than a project or a piece of technology; it’s a mission-critical business system and a significant investment that requires proper planning. Prescient has a five-phased approach or methodology that our intranet consultants use to creating highly effective intranets and digital workplaces. 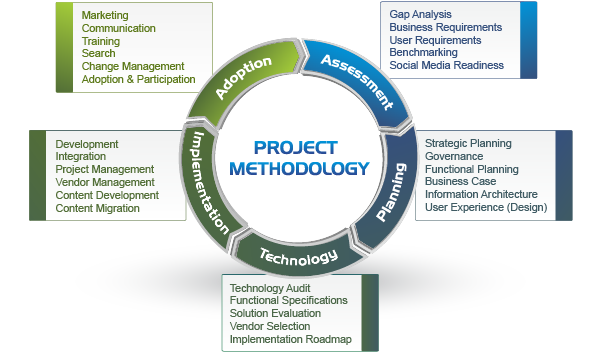 The first phase of this methodology is the Assessment phase, where the business and functional requirements of the intranet are determined and documented. Despite the traditional focus on technology and integration, the most critical phases are the initial ones: Assessment and Planning. At the heart of a website's success is the strength of the plan that governs it, and a successful plan begins with a website or intranet assessment. It is important to gather the needs and requirements of stakeholder and users, at the risk of failure; a representative sampling of user opinions is crucial to gathering an accurate reading on user needs and requirements. For more information on our Website / Intranet Evaluation service or our other consulting services please contact us directly or phone our main office at 416.926.8800.